Yes, applied physics can be fun. 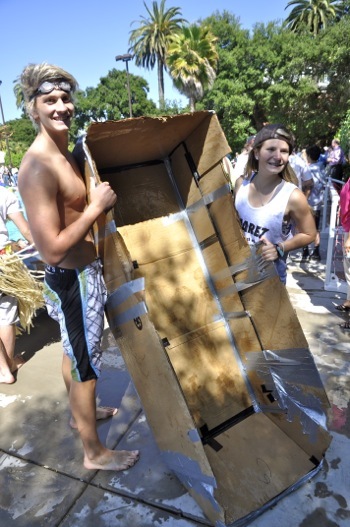 For the eighth year, students at Sacred Heart Prep in Atherton took what they learned in the classroom and put it to use making cardboard canoes that they raced in the school’s pool yesterday afternoon. 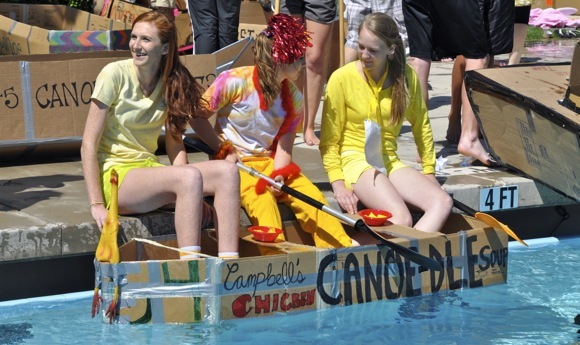 While taking classroom outside — in the truest sense — was one goal of the canoe races, another was to create a school event that would build community, something that students, teachers and alums could all enjoy. 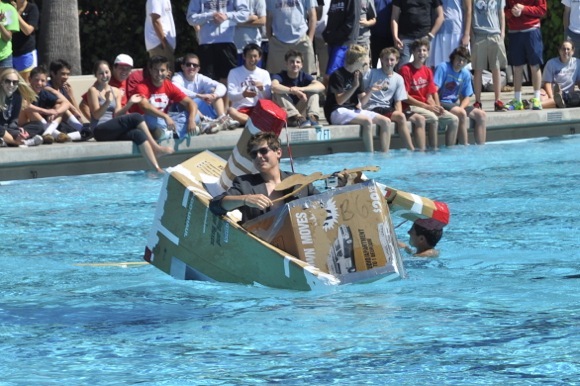 The races are open to any student currently enrolled in physics, although most participants are juniors. This year, about 50 boats were built. Seven heats were held, and seven boats made it to the finals. The winner, which got off to a very late start but paddled furiously to make up for lost ground, featured Zolta and Melissa at the helm (above). The fan favorite of the day was a dramatic reenactment of the sinking of the Titanic (pictured below). This canoe didn’t really race, emerging from its lane well after the competition. It “steamed” to mid-pool, where, encountering an “iceberg,” it “sank,” to the pretend sounds of violin music of one its skippers — and much applause, we should add!